Exclusive, charming, intimate, inviting ... with a personal touch, Playa Azul Golf, Scuba SPA Hotel is located on the beautiful white sandy beach of San Juan, North of Cozumel, 5 minutes away from the airport . The only small boutique oceanfront hotel offering FREE UNLIMITED GOLF!! at the Nicklaus designed Cozumel Country Club. Full breakfast and daily use of snorkel equipment included per room, per stay. New Savia SPA , diveshop on site, Pro-Dive M? 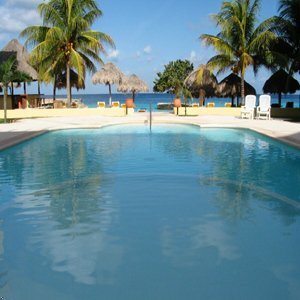 ?xico, a PADI 5-Star Gold Palm IDC Center and National Geographic Dive Center award recipient. ; and "Chan Ka? ?an Restaurant" which offers upscale cuisine with a mexican-chilean-mediterranean fusion. The best and romantic place for weddings and honeymoons. Standard guest room with 2 double beds. Room includes Terracota floor, wicker furniture, exquisite Mexican and Caribbean art, bathroom, multiple closet, refrigerator, coffeemaker, desk, and in-room safe. One bedroom ocean view suite with 2 double beds with separate living area and balcony. Room includes air conditioning..direct dial phone..safe box..hair dryer..private bath..satellite tv..mini fridge..coffe maker..the best Caribbean Ground Coffee..living room with 2 sofas..extra vanity area. From the airport, drive 3 miles north trough Carretera a San Juan, until you see the hotel. * Palma Azul - Open 7am-11pm, casual, International cuisine. * La Palapa - Open 9am-7pm, casual, lunch..snacks..pool bar. * Lobby Bar - Open 1pm-10pm, casual, snack bar. 8 miles north to the property. 2 miles north to the property. 3 miles north to the property.